Romantic Doctor, Teacher Kim is a 2016 South Korean television drama starring Han Suk-kyu as the title character with Yoo Yeon-seok and Seo Hyun-jin. The series has been airing on SBS every Mondays and Tuesdays since November 7, 2016. The story revolves around Boo Young-joo, played by Han Suk-kyu a genius and triple-board certified surgeon who used to work at Seoul’s top hospital Geodae. 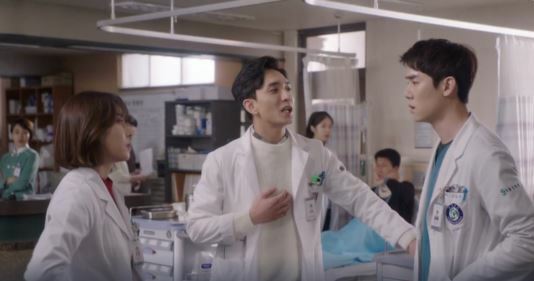 After a traumatic incident, he disappears and changes his name to Kim Sa-bu to work at a small hospital where he guides Kang Dong-joo and Yoon Seo-jeong to become great doctors. We have captured four adorable moments between Yoo Yeon Seok and Seo Hyun Jin, which should make you feel warm and fuzzy! Episode 14 shows the duo kissing for the first time in a long while. Their kiss looked tentative but the kiss appeared notable for Seo Hyun Jin since she accepted his advances after trying so hard to avoid. Yoo Yeon Seok had presented Seo Hyun Jin a necklace for Christmas. He behaved like a true charismatic gentleman when he personally put it around her neck with a heartfelt confession. There is another adorable moment from episode 14. Episode 14 was apprehensive with MERS scare. The scare ended with Yoo Yeon Seok collapsing and Seo Hyun Jin keeping guard by the bedside. They wake up only to find themselves embracing in the sunlit hospital room. The duo decided to portray a fake fight to fool the hospital colleagues, especially Im Won Hee. They started the fight by shouting at each other and all the time looking around to see how others react. But their efforts went in vain as Im Won Hee recognizes they are fooling around. Ah! Those three words had to make it to the list of four adorable moments! 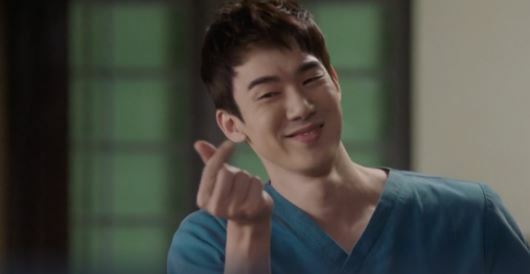 In Episode 15, Yoo Yeon Seok and Seo Hyun Jin play-fight over whether to reveal their relationship status to colleagues. Seo Hyun Jin denies all question about their relationship, even as Yoo Yeon Seo breaks out the three words – “I love you” right in the middle of public space. She then rushes to block his mouth. Those were the four most adorable moments! What do you think about the series? Share your thoughts in the comments section.